From left, back row, Zan Guerry, Stephan Jaeger, Todd and Tracy Tindall. From left, front row, Sandy Weinberg, Brooke Pancake Rende, Karen Smith and Scott Price. 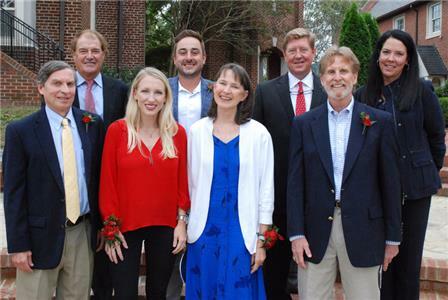 Baylor honored eight members of the school community during the Headmaster's Awards and Memorial Chapel Service on Sunday as part of the school's Alumni Weekend festivities. Nationally acclaimed attorney Sandy Weinberg (class of 1968) was this year's recipient of the Distinguished Alumnus Award. Zan Guerry (class of 1967),Todd Tindall (class of 1980) and his wife, Tracy, received the John T. 'Buddy' Fisher '46 Distinguished Service Award. Scott Price (class of 1974), Stephan Jaeger (class of 2008), and Brooke Pancake Rende (class of 2008) were inducted into the Baylor Sports Hall of Fame. Retired dance instructor Karen Smith received the Dedicated Faculty Award.